How many chevalets are built / being built? Since I built my first chevalet in winter 2011, I have been in touch with a number of LJ’s who were interested in building themselves one. I’m trying to put a list together to see how many there are out there and how many are finished. As of now I know of five finished and I think four more under construction. I won’t list any names here for privacy reasons but I invite you to add your own if you like. It would just be fun to know how many there are. Add a photo as well. I do not have one at the moment. 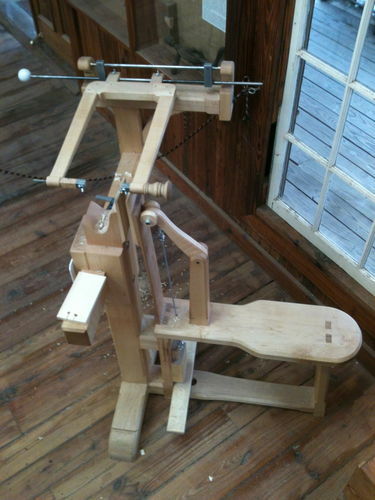 I like the challenge of building one of these odd machines. No place to put it but could probably find a place at WoodCraft to display it. I would like to take one for a spin just to see the difference between it and a scrollsaw(please don’t cringe). For my actual use, a portable benchtop model might more practical. I could see myself designing one of those in the future. The results you find could be interesting. ME! I’m building one. Have to stop, I CAN’T FIND A DARN THING> its driving me crazy I get nothing done this way. No vice, grinder is somewhere in a box, no work bench or surface to mount a vice, WAH! JIM, It’s a saw for doing marquetry. They were developed in France about two hundred years ago. Check my projects. there are three of them there. Here is one that I made. I copied it from the back of Pierre Ramond’s Marquetry book. I had a friend machinist make the blade clamps and movement for the arm. Thanks to Patrick Edwards for letting me look at his as well as Silas Kopf for letting me look at his! Thanks also to Paul for all his input and step by step pictures. Fun stuff! Here are a couple pictures. Enjoy! Mine is only in my futures list! I will build mine (and use it) before I can’t work at all anymore! Thanks for the photos Frank. You were on my list. Are you set up there for the shorter ( 5”) blades? I want to build one at some time in the future for doing more precise marquetry, but nothing planned yet. Franck, pretty impressive one, I love it! I’ve been admiring your chevalet since you showed it the first time, but marquetry is beyond my skill/knowledge level at this time. 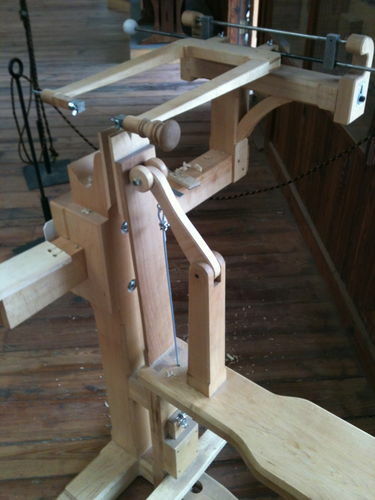 I do use the scroll saw from time to time and was wondering if I could use it as one, especially at Rendezvous (I just came back from the Big Island Rendezvous in Albert Lea, MN) where electricity is not available? Frank what kind of wood did you make yours out of? Going to build one as well as attend Patrick’s school. Should happen in 2013. Already doing stack cut marquetry with a scroll saw, looking forward to learning the new process. I’m on the “near future” list. I have the space for one now but with a new job, not the time. Hoping to see some benchtop models to decide if I want to ride that horse or go with a benchtop version. Patrick Edwards is teaching next Oct 14-18 at Marc Adams School of Woodworking near Indianapolis IN. I was really considering taking this class and learning another approach to marquetry. That would give me a reason to make one of those darn contraptions :) He will also be covering how to build a “chevalet”. I have the schedule for next year and this class is definitely on the short list. He’s also teaching french polishing and a class on protein glues the weekend following this class. If you want to learn from one of the best this is definitely worth looking into. I at one time did a fair bit of this work. In my travels I had not ever heard about a chevalet. I am enjoying the interest evolving with this post. Hopefully a lot more interest in a very intriguing tool. Great post Paul.